Olynstone is the name of the leotard brand, established by a French designer, to be worn specially for club events and competitions for Artistic gymnastics, Rhythmic gymnastics, and Aerobic Sports. Olynstone produces high quality leotards that satisfy international standards. 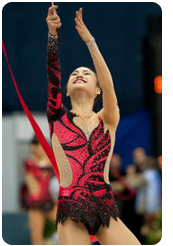 Hence, Olynstone’s leotards are worn by European national team members such as France and Norway, and also by top athletes in Asian countries and America. Most staff and designers at Olynstone played at the national level, so that the Olynstone products are designed and produced not only from the manufacturer’s points of view, but also based on the athletes’points of view and experiences. 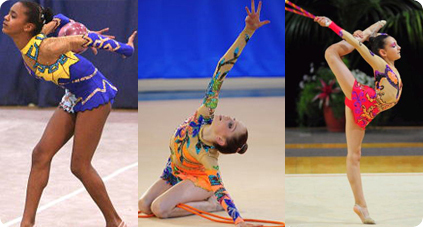 Olynstone’s provides wide range of leotard costumes such as rhythmic gymnastics, gymnastics, aerobics, figure skating, synchronized swimming, for practice and competition, for individual players and for teams. At Olynstone showroom, you can actually see our products. The details of Olynstone showroom is here. In 2010, Olynstone was selected as an official leotard supplier for Fairly Japan POLA, and supplied leotards for ribbon and rope events of rhythmic gymnastics, in collaboration with the world famous designer, Hiroko Koshino. Olynstone designs its unique leotards based on deliberate study to make the players look most beautiful and slender. Premium collection is the line where the leotard are digital printed on the leotard to give gradient effect and shadow and patterns can be drawing and designed and directly printed to the perfect color combination. Those leotards are also one of the kind leotards that can be unique in the world stage competions. Colorful and luxurious leotard collection studded by crystal spangle. Manufactured for the use of competitions with all required features of aesthetic, glamorousness, and beautility. By choosing a pattern from a variety of designs that Olynstone offers, Olynstone is also able to make an original leotard that fits just for you. A collection specialized in spangle embroidery leotards. Olynstone embroiders spangles on the fabrics such as lycra mesh to make the leotards have steric spark to present detailed design and color gradation. A collection for affordable prices. Spangle and crystals can be added by Olynstone for the optional service or you can add decorations by yourself. Leotards under this line can be used for practice, contests and competitions. European collection are special designer drawing leotard can be produced to fit the demands. The customers can see from an illustrated drawing to the final production. Men's rhythmic gymnastics are becoming very popular among the sport in Rhythimic gymnastics. We are offering an line especialy designed for men. Copyright (C)　OLYNSTONE All Rights Reserved.